“Writing on a clean slate” on the iPad is not as fun as one would expect. Most people have conditioned themselves to write between the lines so a completely blank page can be difficult to start and keep things aligned. Of course, drawing is different so you want a blank white iPad screen to work from. Penultimate recognized this and is offering a variety of ‘papers’ to use as background images in their iPad handwriting app. 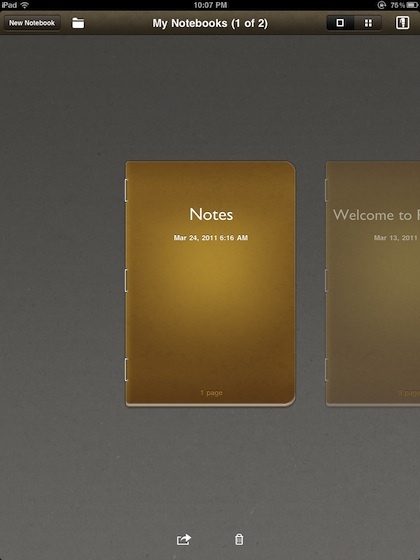 As a reminder, Penultimate is the app that gives you Moleskin like notebooks that you can freely handwrite and draw on the pages. 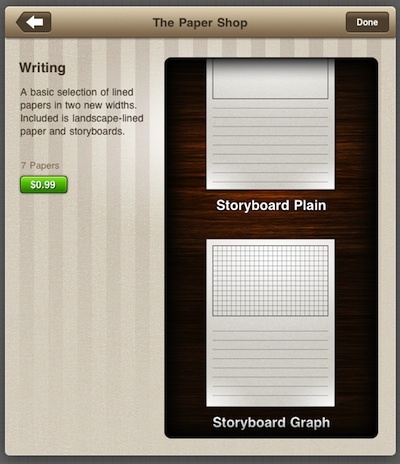 A very handy app if your used to carrying around a paper binder for note taking. 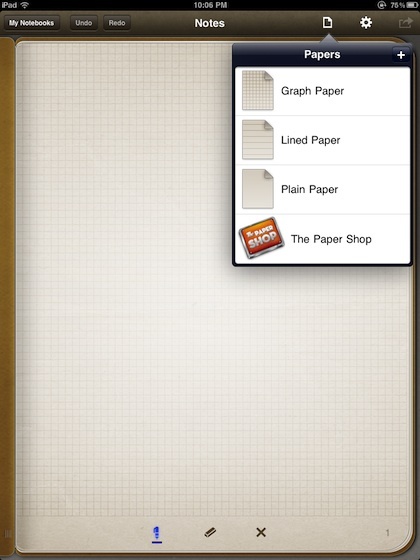 New to the pull down of papers built into Penultimate (Graph, Lined and Plain) is an option to go to The Paper Shop. Which is a store of paper layout types that you can purchase to use. Currently, Penultimate has a long list of lines and layouts, but no paper parchment types. These papers, like rice paper or heavy grained, are less about writing and more about presentation though so they may not come about anytime soon. 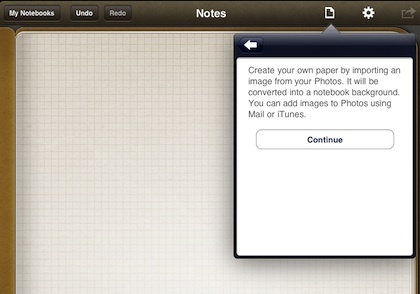 If you have an image or perhaps a scan of a piece of paper you want to use and write on, Penultimate allows you to import that from your iPad’s Photos area. A good way to create paper types you can use especially if lines are not important to you. 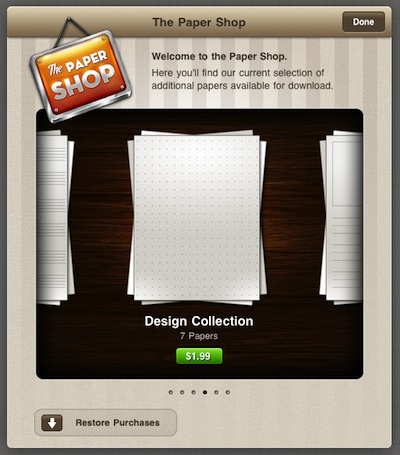 If you choose The Paper Shop from the paper background pull down, a new window opens of paper bundles to purchase. Penultimate offers Writing papers, Design, Music, Graph, etc… You purchase a bundle once and keep using that background as often as you wish. One person on the team said it was like buying a page out of their favorite writing pad and being able to copy/use it unlimited number of times without having to pay for coping it (purchase is per device of course). Each selection is a bundle of like ‘papers’. Penultimate isn’t charging for each individual paper type. Writing has a variety of line separation, and a couple with open drawing areas, much like you would see on specialized pads of paper you may be used to using. We keep a ‘notebook’ for each project and group. Since notebooks are of handwritten digital ink, they are direct replacement of your pad of paper, thus not searchable. 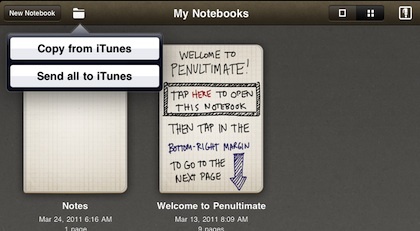 Of course, with Penultimate, you can carry years of handwritten notes everywhere. A tap of the ‘grid’ button in the upper right corner of Penultimate takes you to a view of your notebooks with their first page showing. Sometimes it takes a view of the text to remember which notebook your latest notes should go into where titles are too general. Keeping a backup and reference copy on your desktop computer of your notepads is still done through iTunes.